According to popmech.ru this photo is presented from a private collection of an old Russian Air Force retiree, who have seen with his eyes the flying saucers made for Russian army in 1950s and even had a chance to make this photo. Their AF squad had a task to compete those machines in order to test their characteristics in air fight. This particular photo was made in Russian Air Force base on Shpitzbergen or Slalbard island, north to Norway. Shopped. The foreground is sharp and crisp while the background(grass) is blurry yet the UFO still retains some crispness. OR it’s just the wind blowing and making the grass seem blurry. It IS taken on an island north of Norway and you would think it’s kinda windy in there. Or then it’s a fake. Well, actually, the Russians, after winning WWII (contrary to popular belief the Russians got almost zero help from the other nations at war, because France was badly beaten as was Britain, and the Americans only joined after it was perfectly clear that the Russians would win by themselves), got the German flying saucer technology, plus the scientists. So it’s much more likely than not that the Russians have functioning flying saucers for fifty, maybe sixty-odd years now. Us Canadians will spend that American developement money as fast as they will send it. Great, after each post there is 5-99999 comments and all them telling you the same “FAKE! !1” “SOHOPPED!! !” (they can use corel too!) But why do you care? Because people need to feel like they’re an authority on something. A little late for April Fool’s, mate. But I one that Russia has many many many secret plans that nobody knows about…. Okay, where’s the gianormous sling for that frisbee? Another totally believable photo and story from English Russia. So it’s kind of interesting to see a Russian military base there. This needs to be forwarded to the Weekly World News, the only news source that can be trusted. It was April issue of PopMech and it was Fool’d Day joke, nothing more. It is FAKE. Background look like rendered by some program, and the foreground (Mig 15) have the same colors as image taken by Canon digital SLR camera. There was no color film with this colors back in year 1950. It take only few minutes to create exactly the same shot in 3d animation program, and the guy who created this didn even add film grain to look like old color film……..
Russia only has Barentsburg on Svalbard/Spitsbergen and they always used the airstrip of the Norwegian village Longyearbyen for their Tupolevs, so it is clearly a fake. So just tell us how you really feel??? I am an ALASKA native. three /fourth’s of our village came from Russia. Would like to just find penpal? Yes, Svalbard are Norwegian territory, but USSR has mines on a part of the island. In -50 and till middle of -70 they have their own military air force base with a short airstrip in Spitsbergen. From ca. 1988 Russians used the bigger Norwegian airstrip in Longyearbyen. My friend was on Svalbard as a civilian photographer from 1973 to 1977 and from 1979 to 1985. Hie took a lot of pictures both for Norwegian scientist and for National Geographich magasine. I have seen several pictures mostely like this in his collections. am i the only one who see a blurry background- from the camera operator fallowing the movement of the airplane, and yet this “flying saucer” is perfectly in focus? also the “shadow” underneath it is obviously from photoshop. as much as this would be great to answer where they came from, i doubt this is a genuine flying saucer.. . . and the terrain is obviously not NORTH OF NORWAY??? 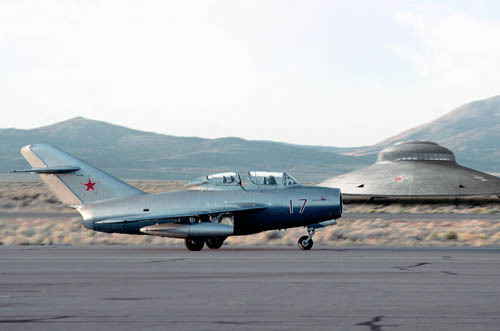 this does look like Nevada .. this is probably taken at an airshow in Las Vegas or Reno or something. .